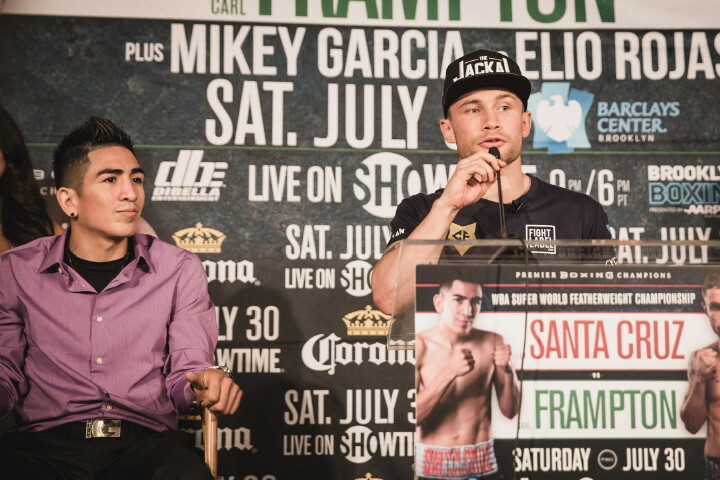 (Photo credit: Amanda Westcott/SHOWTIME) BROOKLYN (July 28, 2016) – Undefeated three-division world champion Leo Santa Cruz and undefeated former unified 122-pound world champion Carl Frampton went face-to-face Thursday at the final press conference before their featherweight world title clash that headlines a SHOWTIME CHAMPIONSHIP BOXING triple-header this Saturday, July 30 live from Barclays Center in Brooklyn. Televised coverage begins on SHOWTIMEat 9 p.m. ET/6 p.m. PT and features undefeated former world champion Mikey Garcia taking on former world champion Elio Rojas in the co-main event,plus once-beaten contenders Tony Harrison and Sergey Rabchenko in a junior middleweight title eliminator. Two-time world champion Paulie Malignaggi meets fellow Brooklynite Gabriel Bracero in the SHOWTIME EXTREME main event. Coverage begins at 7 p.m. ET/PT with a lightweight battle between Ivan Redkach and Tevin Farmer. Tickets for the live event, which is presented by Premier Boxing Champions and promoted by DiBella Entertainment in association with Cyclone Promotions, start at $38 and can be purchased online by visiting www.ticketmaster.com, www.barclayscenter.com or by calling 1-800-745-3000. Tickets are also available at the American Express Box Office at Barclays Center. Group discounts are available by calling 844-BKLYN-GP. “I’m glad that my whole family is here and I’m thankful to my whole team that got me ready for this opportunity. “I’m so happy to have my dad here. We thought about not taking this fight when he got the [cancer] diagnosis. He’s always been there with me since the beginning of my career. Since I was very small. When the doctors told me that he would be in my corner, I was even more ready for this fight. “I know that this is going to be an interesting fight. We’re both undefeated and we’re going to make it a war. Neither of us wants that first loss. We’re going to leave it all in the ring. This won’t be an easy fight. It’s a 50-50 fight. The fighter who wants it the most will win the night. “I’ve worked very hard in the gym and I feel strong at 126 pounds. This new weight suits me and you will see the result in the ring. “Nothing can compare to this opportunity. People know me in Belfast, but Leo Santa Cruz is a three-weight world champion who gives me the opportunity to become more well known. “This fight sells itself. I respect all my opponents until I’m disrespected myself. I respect Leo because of his actions and because of the great fighter that he is. “I’m a different animal now at 126 pounds. I was only performing at 70 or 80 percent of what my capabilities were. I’m feeling strong and I’m a different fighter. This will be my best performance. “It’s been a while since I’ve done this but I’m very excited to be back. I want to thank everyone who helped put this fight together. “Everybody has said it all. We’re ready. We’re prepared and we’ve had a great training camp. Rojas has the boxing skills to make this complicated. “I’m very thankful for this opportunity. I’m really happy about being on this show. In this fight. I know I’m being brought in as an opponent, but I’m going to let the fans know that I’m not just an opponent. “I’m just excited to be back on a platform like this. I’m ready put in work. I know my opponent doesn’t speak much English, but I bet he speaks hands. “No disrespect to Ricky Hatton, because what he’s done for his country and for Rabchenko is amazing, but I don’t care about it at all. Seeing Ricky over there fuels me even more to get the win. “I just had a son, he’s three months old. He’s my new motivation. We’ve pushed it to the max in training camp. I’m ready to swim with the sharks. I’ve transitioned from a sprinter to a marathon runner. I’m ready to go into the later rounds. “This is a very nice country and a great city for boxing. It’s my first time here and it’s very exciting. I’m going to give the fans a really good fight. “I hear young guys like Tony Harrison and Tevin Farmer come up here and talk, it reminds me of my young days. The gym I train in down in Miami is full of young guys hungry to break through. That’s the feeling we all used to have in the gym. It starts to rub off on you when you hang around motivated people. “I need to have great motivation and that fire to return to the top level. I took a couple steps back after the Garcia fight and gradually stepped up. I think Gabe is another step up. He’s a hungry and motivated guy. “I know Gabriel Bracero, not only as a fighter, but I know his spirit. We came up together in the same generation of New York fighters. “I want to thank Tommy Gallagher, my trainer. He always stood by my side and always believed in me. No matter what the critics said. It’s because of him that I’m standing here now. “I’ve made mistakes in life. I was away from this sport for a while. Boxing was always my dream though. I stayed focused so that I can come out and do what I’m doing now. Not too many people can bounce back from a situation like that. “Saturday is a big fight and I’m looking forward to it. I’m really thankful that Paulie gave me this opportunity. I always followed his career and his successes. It was a dream of mine to come out here and have the same success he had. I looked up to him. “To be here right now and to be able to fight Paulie is incredible. He’s giving me the opportunity to reach his level of success. “I’m very thankful to be part of such a great event. I changed a lot about my training heading into this fight. I’ve trained with the great champion Leo Santa Cruz and it has me ready. “I want to thank my training staff for preparing me for battle Saturday night. I’m thankful for this opportunity. “This is another chance to show the world who I am. I have about three years with no losses. I started boxing as a hobby. But when I realized how much talent I had, I started training right. “Since I started taking this sport seriously, I’ve been taking guys out easily. Ivan Redkach will get this work. It’s going to be easy. “To be here with these great fighters is an amazing opportunity. I’m very honored. I’m ready to fight and successfully defend my title. “We’re delighted to be here in Manhattan for this potential Fight of the Year. The whole team that made this fight happen has been fantastic. “I just wanted to say that we’re thrilled that Jose Santa Cruz is back on his feet, every one of our families is affected by cancer. “I think that this is the best card that I’ve ever been able to promote. This is the deepest boxing card from top to bottom that I’ve seen. “Barclays Center has become one of the homes for great boxing. It is the premier venue right now for boxing in this country. The Brooklyn Boxing program is something that Barclays Center is truly committed to. “If you’re from Brooklyn, then you want that Brooklyn Belt. It’s about carrying the mantle of being that guy from Brooklyn. That’s what both Paulie and Gabe are going to try to do. “SHOWTIME has been bringing its viewers the best, most competitive fights of the year, and Saturday will be no exception. “The 154-pound division is the deepest and hottest in the sport. Tony Harrison and Rabchenko are looking to make their mark and get up to the next level of the division. “Having Mikey Garcia back is a treat. It’s a big positive for the sports of boxing. Elio Rojas is not just an opponent though. He is tough, he is hungry and I expect this to be an amazing fight as well. “The main event is again the best versus the best. Two of the most aggressive fighters in any division. There’s nothing else to say about this fight other than that it will be all action. I think this fight could be better than Thurman vs. Porter. “This is arguably the strongest card from top to bottom that we’ve had in Brooklyn since we’ve hosted fight cards. This will be a great follow-up to the incredible Thurman vs. Porter fight last fight. We expect another headlining fight that could be a leading contender for Fight of the Year. We are honored to welcome these two great competitors to Brooklyn. They are two of the most exciting fighters in the sport and we wish both of you the best on Saturday. “Saturday’s card certainly has a Brooklyn flavor to it. It begins with Bensonhurst’s Paulie Malignaggi taking on Gabriel Bracero from Sunset Park with the Brooklyn’s World Championship on the line.